When Nick (Elijah Wood) discovers that he's won a dinner date with his favorite actress Jill Goddard (Sasha Grey), he's incredibly excited to finally get the chance to meet her. Unfortunately Jill refuses to honor the contest and all of Nick's hopes are dashed. He's intrigued when Chord (Neil Maskell), a man claiming to be Jill's campaign manager, offers him something he can't quite refuse. Nick agrees to the game but soon has to realize that he is only a puppet in the manic plan devised by Chord. "Open Windows thrills and chills, and then roars across the finish line with the checkered flag waving in victory." 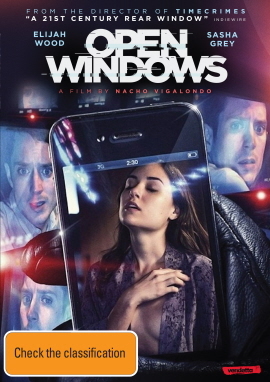 "Open Windows elevates Hitchcockian suspense to jittery new levels of mayhem and paranoia. "Anyone excited about innovative filmmaking approaches won't want to miss this one."